"Drumming is good for the body, mind and soul!" Don't miss this opportunity to bring an ancient, spiritual and healing practice into your own life. 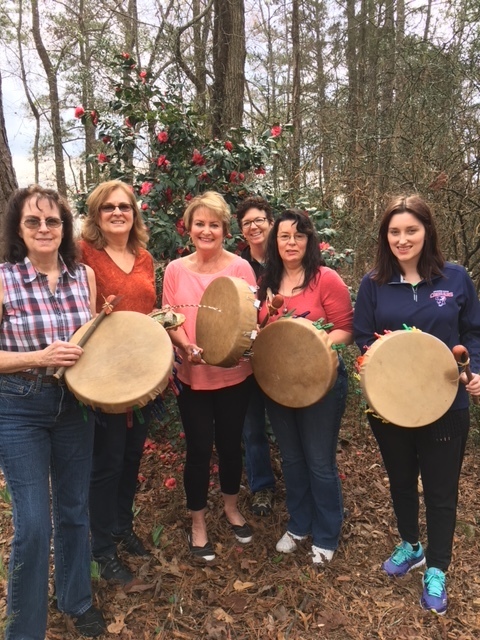 Our Drum Making Classes are offered throughout the year and are held on a 200-acre horse farm in Waverly Hall, GA. Each participant will receive instruction on how to assemble their very own Native American hand-drum. The process is ceremonial from start to finish and truly bonds us to our drum and our own sacred rhythms. 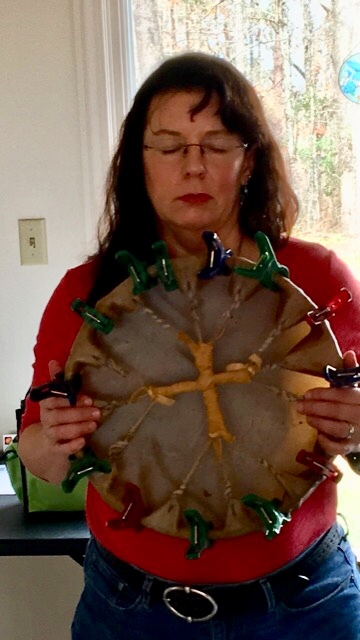 Come connect with your own rhythm with the Awakening Your Fierce Feminine Fire’s Drum Making Class. We gather at 10:00 AM in the Farmhouse at Ridgeway Place, Waverly Hall, GA, and spend about 2 ½ hrs together. When you arrive, we will first explore the history and the mind, body and spiritual benefits of drumming. We lay out the hides and ask each woman, one at a time, to choose the hide that calls to her. Then we take a moment to state our intention in making the drum. We ask you to write your intention on the inside of the drum frame. Then, with further meditation, we ask you to name your drum and also write the name that comes to you on the inside of the drum frame. While following instructional pictures and working in pairs, we go through the steps of wrapping the hide around the frame, and securing the hide with rawhide strips. The hide is stretch, knotted, secured and then held into place with clips to allow the drum to dry. We also make the drum sticks. When the drum making is complete, we bring our drum to our hearts and give thanks to the animal that gave its hide, the tree that gave from its wood, and we ask Great Spirit to bless our drum. Then we go outside and initiate the drums with a sacred sage smudging. It's such a sacred ceremony that truly bonds us to our drum. The ceremony is followed by a light lunch in the Farmhouse. All drum materials, instruction, and lunch is provided. Learn about the healing power of drumming ! We welcome all women to come and explore your own rhythm and take part in the creative journey of drumming. No prior drumming experience is required for this class. We ask that you come with an open mind and open heart. The spirit of the the drum has a lot to share with us! Contact me at fiercefemininefire@gmail.com with any questions.